After seeing her sons returned safely to her in the wilderness, Sariah exclaimed; “…Now I know of a surety that the Lord hath commanded my husband to flee into the wilderness; yea, and I also know of a surety that the Lord hath protected my sons, and delivered them out of the hands of Laban, and given them power whereby they could accomplish the thing which the Lord hath commanded them…” (1 Nephi 5:8) Sariah was overwhelmed with joy and filled with the Spirit of the Lord, because she now believed that Lehi was a prophet of God. They all rejoiced and offered sacrifices unto the Lord, they then searched through the plates to find; “…that they did contain the five books of Moses, which gave an account of the creation of the world, and also of Adam and Eve, who were our first parents; And also a record of the Jews from the beginning, even down to the commencement of the reign of Zedekiah, king of Judah;” (1 Nephi 5:11-13) Nephi and his family now had the first five books of the Bible that we know today, they would be blessed with this information in their day of prophets that had lived before them, as we are blessed by the Book of Mormon and Bible today in modern times. They also discover that Laban was a descendant of Joseph, wherefore he and his fathers had kept the records. Lehi was filled with the Spirit and began to prophecy exclaiming that these plates of brass would go forth among all nations, and tongues! Nephi, now dressed in the clothes of Laban goes towards the treasury to retrieve the Brass Plates when he runs into one of the servants of Laban, who had the keys to the treasury. 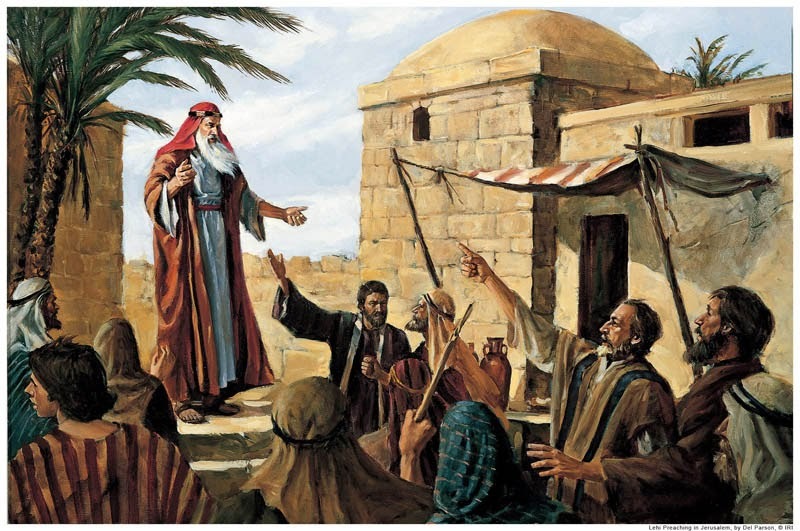 Nephi; “…commanded him in the voice of Laban, that he should go with [Nephi] into the treasury.” (1 Nephi 4:20) Laban’s servant thought it was his master speaking and therefore opened the treasury. 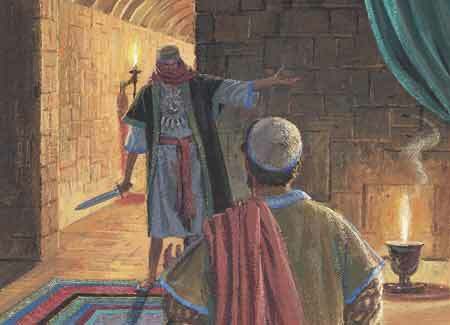 Nephi tells the servant to grab the Brass Plates and commands him to follow him to the outside gates of the house. The servant agrees and flees with ‘Laban’ aka Nephi to meet Nephi’s brothers. When he approached the outside walls, Laman and Lemuel were exceedingly frightened; “…for they supposed it was Laban, and that he had slain me and had sought to take away their lives also. And it came to pass that I called after them, and they did hear me; wherefore they did cease to flee from my presence.” (1 Nephi 4:28-29) Laban’s servant tries to flee, but Nephi being large in stature holds him and prevents him from running. Nephi comes out from his tent, after having spoken with God… he explains that he has ‘dreamed a dream’ in which him and his brothers are to return to Jerusalem to obtain Brass Plates from a man named Laban; “…Laban hath the record of the Jews and also a genealogy of my forefathers, and they are engraven upon plates of brass.” (1 Nephi 3:3) Nephi’s brothers murmur and tell Nephi that he asks too much of them. However, Nephi explains that it is not his command, but the commandment of God for them to retrieve these Brass Plates. Nephi speaks to his father; “…I will go and do the things which the Lord hath commanded, for I know that the Lord giveth no commandments unto the children of men, save he shall prepare a way for them that they may accomplish the thing which he commandeth them.” (1 Nephi 3:7) Lehi, after having heard these words was filled with joy… because he knew that Nephi had been commanded of God to do these things, and he felt blessed. Nephi showed great character and faith in following the commandments of God no matter how difficult. This example can be used for all! Laman was able to flee from his presences and return to his brethren outside of the house. Nephi’s brothers are determined to flee Jerusalem; however Nephi reminds them that God had commanded them to obtain the records. Nephi speaks to his brothers; “…As the Lord liveth, and as we live, we will not go down unto our father in the wilderness until we have accomplished the thing which the Lord hath commanded us. Wherefore, let us be faithful in keeping the commandments of the Lord; therefore let us go down to the land of our father’s inheritance, for behold he left gold and silver, and all manner of riches. And all this he hath done because of the commandments of the Lord.” (1 Nephi 3:15-16) Nephi reminds them that with God, all is possible. 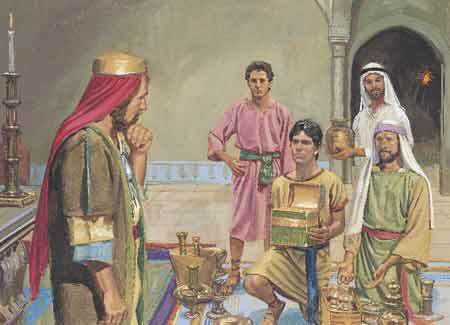 Nephi derives a plan to return to the house of their father to take their inheritance (gold and silver) to please Laban and essentially buy the plates from him. Nephi explains to his brothers that after Jerusalem is destroyed, it would be up to them to preserve the record of their children. Nephi and his brothers retrieve their inheritances and return to speak with Laban. This time Laban became greedy and desired both the Brass Plates and the precious metals; “…when Laban saw our property, and that it was exceedingly great, he did lust after it, insomuch that he thrust us out, and sent his servants to slay us, that he might obtain our property.” (1 Nephi 3:25) Nephi and his brothers AGAIN flee from the house of Laban. Because they were faithful, the Lord did protect them and the servants of Laban were unsuccessful of overtaking them in the wilderness and destroying them. Even after having seen an angel of the Lord, both Laman and Lemuel began to murmur again saying; “…How is it possible that the Lord will deliver Laban into our hands? Behold, he is a mighty man, and he can command fifty, yea, even he can slay fifty; then why not us?” (1 Nephi 3:31) Both Laman and Lemuel had yet to come to believe in the Lord and His great power! The Lord God speaks to Lehi in a drew and commands him that he should depart from Jerusalem and take his family into the wilderness. The Lord promises Nephi that if he continues to have faith and keep the commandments of God that he would be led to the Promised Land. The Lord also promises that Nephi would be delivered from his brothers if they tried to hurt him. Nephi proceeds to tell how his father, Lehi, prayed to God on behalf of his brethren in Jerusalem where he is overcome with what the Lord tells him. Nephi explains that Lehi (his father) preached these words to the Jews, but they rejected him because of the things he testified of. We have all heard of the Bible (or at least most of the world has) and most of the world has probably heard about the Book of Mormon. But how many of those people actually know what the Book of Mormon really is? Do you know? Some might say it is the “Bible” of the Mormons, or say that it is the book that Joseph Smith wrote. Both are wrong. The Book of Mormon is a history of the ancient inhabitants of the Americas, and has a history that goes back as far as the falling of the Tower of Babel! The Book of Mormon is not the “Bible” of the Mormons, it is a companion to the Bible. The Mormons (Members of The Church of Jesus Christ of Latter Day Saints, or LDS for short) believe in the Holy Bible (members in the US and English speaking countries use the King James Version of the Bible), and believe that the Book of Mormon and the Bible go hand in hand. Both are needed to understand God’s entire message. “The Book of Mormon is a volume of holy scripture comparable to the Bible. It is a record of God’s dealings with the ancient inhabitants of the Americas and contains the fulness of the everlasting gospel. The book was written by many ancient prophets by the spirit of prophecy and revelation. Their words, written on gold plates, were quoted and abridged by a prophet-historian named Mormon. The record gives an account of two great civilizations. One came from Jerusalem in 600 B.C., and afterward separated into two nations, known as the Nephites and the Lamanites. The other came much earlier when the Lord confounded the tongues at the Tower of Babel. This group is known as the Jaredites. After thousands of years, all were destroyed except the Lamanites, and they are among the ancestors of the American Indians. ‘ Behold, I would exhort you that when ye shall read these things, if it be wisdom in God that ye should read them, that ye would remember how merciful the Lord hath been unto the children of men, from the creation of Adam even down until the time that ye shall receive these things, and ponder it in your hearts. Think about it, the Bible was written in the “Old World” or what we know today as the Middle East. 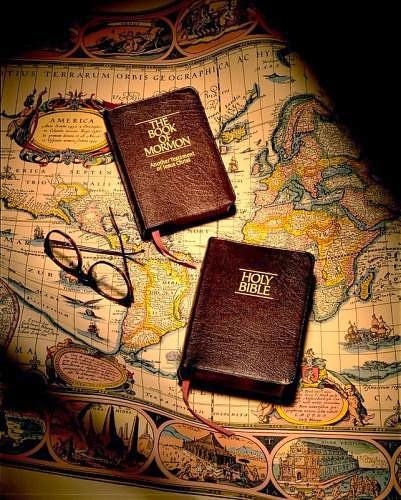 Whereas the Book of Mormon was written in the “New World” or what we know today as the Americas. God had his children dispersed after the falling of the Tower of Babel and scattered among the world. So, why would God only call prophets in one part of the world? Why would he give his word or “light” to those in the middle east and leave the rest of his children in other parts of the world with no word and no “light”, ultimately leaving them in the dark? That doesn’t sound like God. God loves all of his children and called prophets all over the world. Remember the Dead Sea Scrolls? We know that there is more “word” of God than what is in the Bible. “A merchant man, seeking goodly pearls … , when he had found one pearl of great price, went and sold all that he had, and bought it” (Matthew 13:45–46). The Pearl of Great Price contains four books and the Articles of Faith; Selections from the Book of Moses, The Book of Abraham, Joseph Smith Translation of the Gospel of Matthew and the History of Joseph Smith. The Articles of Faith outline the basic beliefs of The Church of Jesus Christ of Latter-Day Saints. All of the books are divine in nature, and were originally published in Church publications and were declared by Joseph Smith to be; “a source of much instruction and edification to many thousands of the Saints, who will by an acquaintance with its precious contents, be more abundantly qualified to set forth and defend the principles of our Holy Faith before all men” (Millennial Star, 15 July 1851, 217). The book of Abraham is a translation of ancient records written on papyrus that came into the possession of the Church in 1835. The records were translated by Joseph Smith through revelation. This book contains truths about the premortal Council in Heaven, the creation of the earth, the nature of God, and the priesthood.